In the name of Chartership I've been following my mentors wise words and trying to get experience of libraries outside the academic sector. I was fortunate that CILIP CIG were running a visit to the BFI Reuben Library in London and so I tagged along. Our visit started with a quick tour of the library and it's facilities. Housed in a light and airy reading room on the South Bank, the library is very welcoming and provides a nice contrast to the hustle and bustle outside. The library has only been in it's current location for a short time, having previously been housed at a number of sites across London. 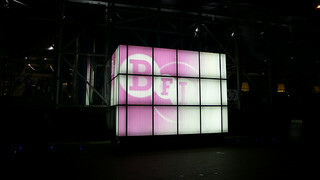 The BFI itself was established in 1934 and now has the world's largest collection of written material on film and television. The library also has access to a large archive and special collections section, which relies mainly on donations. Although the collection includes international material there is an obvious British focus. The library itself is very much focused on keeping hard copies of the material that they offer, something I've seen other libraries shifting away from. They want to provide a place where users can read around a topic, as well as having access to some of the primary film and television material. One of the most frequently asked questions at the BFI is whether they can make some of the footage that they hold available online but there are many complicated copyright issues around doing this. This is something that I think users often fail to understand across all libraries - I know I spend quite a lot of time trying to explain why things can't be scanned or photocopied in excess! The library has several digitisation projects. It has digitised 4.1 million press cuttings dating from 1935-2010 and made these available on an on-house database (for copyright reasons). These are intended as a primary source for researchers who can see the popular opinions of films from when they were actually released (some are less than complimentary!). This resource is extremely popular with both students and journalists. I've always been somewhat on the fence about digitisation in that sometimes I think libraries just rush to digitise things for the sake of it. However I think that this project is wonderful and a great asset to the library. The library also holds a number of items that are only available as microforms and there are plans to digitise these in the future. The staff were keen to stress that the resources in the library are not purely of interest to those researching film but also to social history researchers. Resources like the above mentioned reviews, interviews with people in the industry and magazines from the time can all help researchers to discover more about 'real life' in the past rather than just the big moments in history. They can see the film making process through multiple eyes - that of the actor, director or critic. For example, scripts with notations made in a margin will tell you more about the creative process than a textbook ever could. The collection also showcases how companies used to market their films, which again will be of interest of those studying marketing as well as film. I've worked on a project with similar material and so this is something I can relate to. I catalogued nineteenth century ephemera which had previously been dismissed but to today's researchers provides a valuable archive of social history material. The BFI library used to be for member use only but is now free for anyone to use. Although the library ask for study space to be reserved people are free to come in and browse the latest industry journals or magazines. People often visit the BFI to see a film and then stop in to read the biography of the leading actor. The library also tries to maintain an active outreach program connected with events and film showings at the BFI. The BFI Reuben Library is an undiscovered gem and I would recommend a visit to anyone interested in any aspect of film, television or social history.